Canaan is the name of a village in the township of North Canaan, Litchfield County, CT. 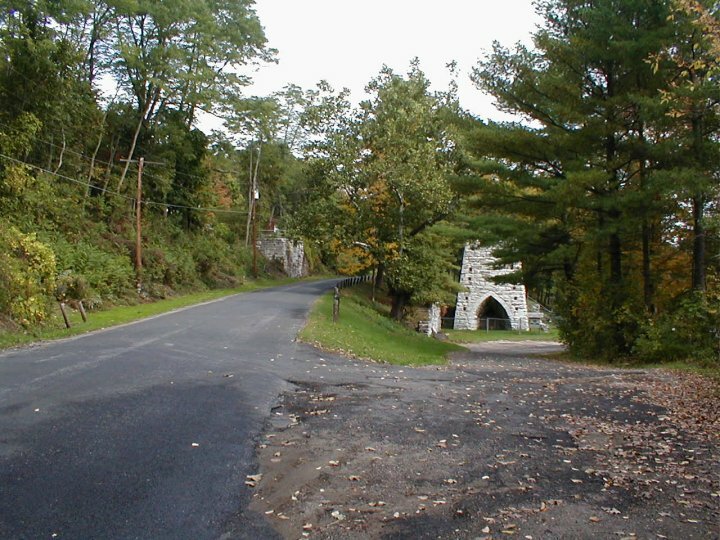 However, Canaan is also the name of an adjacent township in Litchfield County, the principal village of which is Falls Village. Both are located in the state's Northwest Corner. Both these Canaans were once a single township. To thoroughly confuse matters, there is a much better known place in Connecticut called New Canaan -- but New Canaan is in Fairfield County, around 50 miles south of the Northwest Corner's two Canaans. A good summary can be found on a State of Connecticut sign -- and this particular one is located in the Falls Village Canaan, not the North Canaan Canaan. Click on the picture of the sign to the right to see a larger image. There's a similar sign in North Canaan, near the athletic field. North Canaan is one of the fortunate small towns that had a citizen -- a local newspaper editor -- who actually wrote a book about it. You can check the index to that book. He called it "Scrapbook of North Canaan" Please CLICK HERE for more information about that book and how you can get a copy. Pilgrim Church, the former Congregational Church in Canaan village, was actually the second Congregational Church in the town of North Canaan. The original Congregational Church here, once located between Canaan and East Canaan, was moved to East Canaan. Now, most people refer to that one as the East Canaan Church. However, now that the Pilgrim Church merged into it a few years ago, it is correctly called the "North Canaan Congregational Church". The old Pilgrim Church building in the village of Canaan is now the home of a Baptist congregation. The entity that published the Manuals no longer exists as a separate congregation. We have scanned and indexed two editions of the Pilgrim Church's "Manuals" -- the 1912 and 1937 editions of these historic church directories. Each around 40 pages long, they contain membership rolls, history of the church, and other information that may be of interest. The indices to the two manuals are on-line now. View the index of the 1912 Manual, or view the index of the 1937 Manual. Both are now available as downloads. 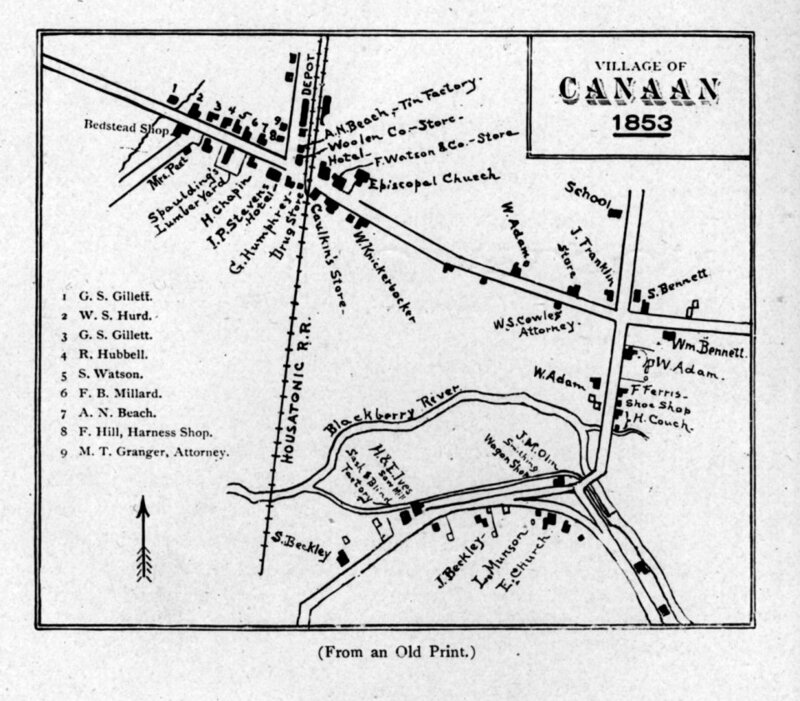 Here's an 1853 map of Canaan Village. Click on it to see it in detail. Here are a few pictures of North Canaan today (well, not exactly today -- how about 2003?). 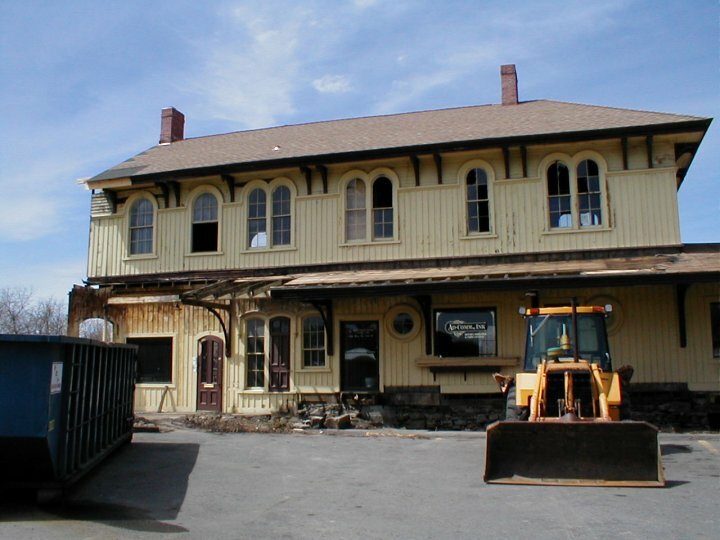 One of several historic houses at the "Lower Crossing"
Remains of historic Canaan Union Station after the fire. It's since been substantially rebuilt. Collin's Diner -- no, that is NOT a spelling error! The diner was founded by a member of the Collin family! 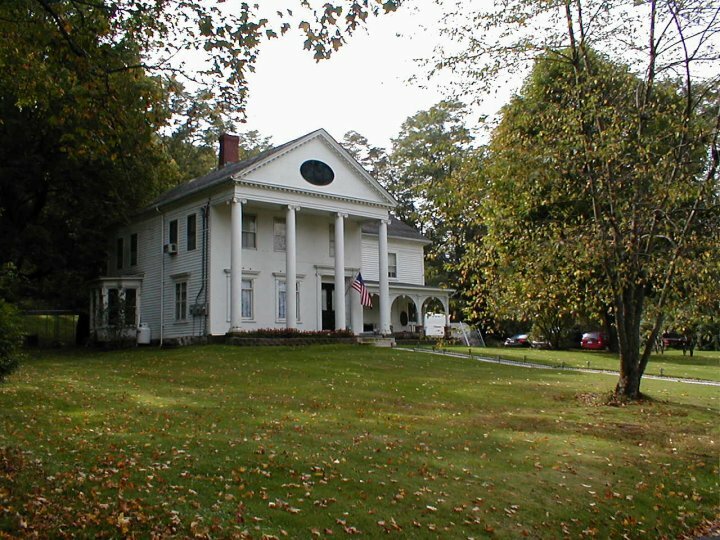 For other material about Canaan (Falls Village) and North Canaan, see the Canaan section of our Litchfield County page. Enjoy a FREE article written by Mary Geikie Adam about the history of Canaan from the 1896 Connecticut Quarterly. It's free -- and it's interesting! The White Oak for 1954, yearbook of Housatonic Valley Regional High School, Falls Village. Includes the towns of Canaan and North Canaan. See our Litchfield County page for more information. Delegates' Reports: CT Board of Agriculture (1869) -- The report from the Litchfield County delegate begins on page 21 of this document. See our Connecticut miscellany page for more information. Included is a report on an agricultural exposition in Falls Village. QUERY: Steam irons made in Falls Village? The Blakeney Cooperative Co.? Recently we saw what we think is a real oddity: a "steam iron" that isn't electric -- one that, like other old irons one sees at antique shows and tag sales, was heated on the family range before ironing with it. Making this even more interesting is the fact that this iron was manufactured in Falls Village! The owner of the iron would like to learn more about it, so would we -- and so would the Falls Village -- Canaan Historical Society!! Be sure to check our catalog!